*This is a sponsored post: but all opinions, and dance moves are my own! Have you heard yet that the Yo Gabba Gabba Live show is making its way to Perth for the 1ST TIME EVER? To be honest, I was pretty excited when I found out that DJ Lance and the crew were including Perth in their tour this time round. I may have actually jumped out of my seat and squealed a little bit (who have I beome?!?). A few years ago I never thought I would get excited about something like this, and then well, I became a parent, and the thought of my little boy having an absolute blast, being super excited and getting his Dancey Dance on makes me pretty stoked as a Mum, and the fact that I get to enjoy it with him is pretty special. I mean, we had a pretty awesome dancey dance time ourselves this afternoon, rocking out to some Spoon and Led Zeppelin, playing air guitar and singing into plastic cutlery microphones, but I'm so looking forward to seeing his face when he realises that all his favourite characters have come out of the TV! Plus, I will totally admit that Yo Gabba Gabba is one of my favourite kid shows, I love their positive messages in each episode. But, it might also have something to do with my punk-rock loving teenage years and the fact that one of the creators is from the Aquabats, so the show includes heaps of awesome bands (like The Roots and MGMT) and famous personalities, so I like to watch too! I'm also pretty keen to find out who the surprise Super Music Friends live band will be at the Perth show, and who the special dancey dance guests are! See, its not just for the kids! We've been listening to the Yo Gabba Gabba CD's since Ez was a baby, basically because he loves it, and I can't stand any other kids CD's. I know the Super Music Friends album off by heart, and of course I find myself singing "You can't always get what you want" song to Ezra fairly often, and I probably get a little too into Pool Party by the Aquabats, to the point that people in other cars stare. So, just like when I was 13 at my first Silverchair concert, I will be one of the many I'm sure singing along to every word! Luckily, my kids aren't old enough to be embarrassed by me yet! So lots of singing, lots of dancing, lots of favourite songs and new ones too, plus special guests, and if the past shows on the east coast are anything to go by, it is going to be such an awesome show, for all ages! It's coming up really soon, next month actually, so make sure you get your tickets! You do not want to miss out on a chance to get your sillies out! You can even get platinum tickets that give you the opportunity to get photos with the Yo Gabba Gabba Cast! For ticket and event information visit www.zaccariagroup.com. For full tour information visit www.yogabbagabbalive.com.au. 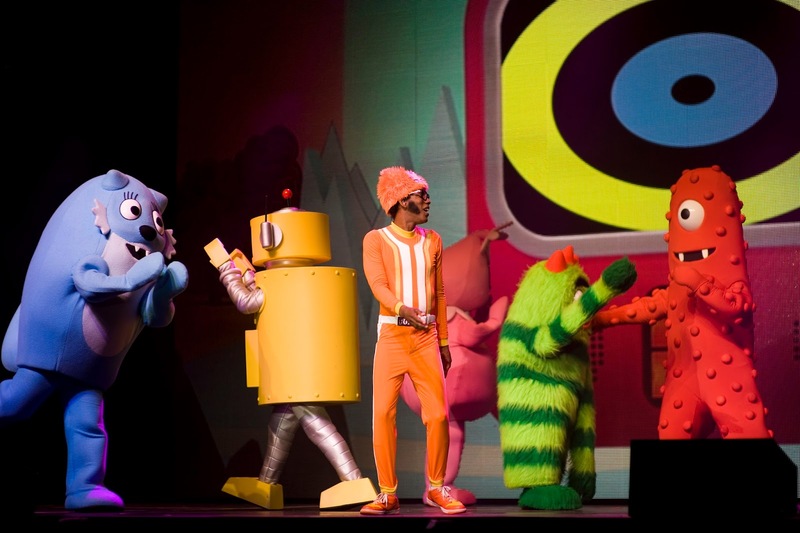 WIN A FAMILY PASS (Admits 4) to the YO GABBA GABBA LIVE SHOW IN PERTH! just follow this link to enter the giveaway on the Yellow Dandy Facebook Page! Here is a clip from the 2010 Yo Gabba Gabba Live show, if you want to get an idea of what you're in for!! Sorry Non-West Aussies, this is a special giveaway for my fellow WA dwellers! 4 comments on "Yo Gabba Gabba LIVE is coming to PERTH (WIN A FAMILY PASS)"
I love Yo Gabba Gabba! I didn't know you were a Perthie!! Oh I would go to that concert even without kids! How cool are yo gabba gabba?